My Sandwich Generation: Self Preservation Without the Headache mysandwichgeneration.com » GIVE ME A BREAK! Posted in Uncategorized 9 years, 10 months ago at 11:26 pm. Thank you so much! I’m so glad that you enjoyed! Wow…such an adventure. LOL! Glad she’s okay. Yeah..she could have found herself on a plane for Maui with Faye..hmmmm Happy Daze? Maui? Happy Daze? Maui? OMG! You are so funny… er… or should I say Ruth is! I have a friend who has his mother live with him and his wife. They live in a gated golf community. One day he’s at work and he gets a phone call from the golf pro to tell him that his mother is at the clubhouse. 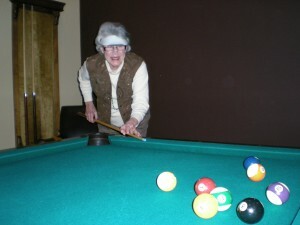 She’s 92 years old, uses a walker to get around, and the clubhouse is a mile-and-a-half from the house! When the pro asked her how she got there she said that she walked there and that she was waiting for the bus to Cleveland. Just to be perfectly clear, there was no bus going to Cleveland or any bus going anywhere for that matter. My friend told me that apparently the bus theme of having to go somewhere is a common problem for individuals with memory challenges. So much so that he informed me that in Germany, some elderly care facilities have installed bus stop signs at the end of their parking lots. When a patient/border goes missing, they go down to the bus stop oftentimes finding them there waiting for the bus. I can imagine, no more doors. Just let everyone out every day and just before dinner, drive down with a van to the bus stop facade, round everybody up, bring them back to the facility, and dinner is on. ROFL! Ted..that is sooo funny! What a great idea to put a bus stop sign in Happy Daze! I might need to pass THAT on! Have a great day! Always a pleasure to hear from you!